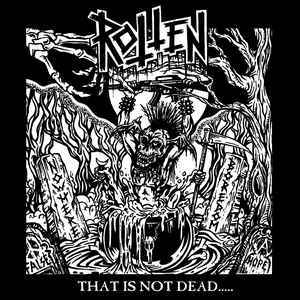 HELLS HEADBANGERS is proud to present the highly anticipated debut album of ROTTEN UK, That Is Not Dead. Although pure punk rock is a rarity on HELLS HEADBANGERS, the form ROTTEN UK play – and proceed to uniquely twist to their own design – is actually a variety that inspired many early speed metal and thrash bands: commonly known as UK82, this subgenre was indeed a strain of early ’80s UK punk that synthesized the anthemic Oi! style before it with the nascent harder/faster style pioneered by the likes of Discharge, The Exploited, and GBH. Categories: DISTRIBUTION, DISTRO STORE, Vinyl_Corner, VINYL-Distribution, VINYL-RECORDS. Tags: Death Metal, Goth Rock, Hells Headbangers ‎, Punk. With other stated influences that include early Finnish legends like Kaaos and Riistetyt as well as England’s Disorder and Broken Bones, ROTTEN UK almost effortlessly create a 14-song whirlwind of dark ‘n’ desperate ANTHEMS with That Is Not Dead.